East Renfrewshire MP competing with MSPs Neil Findlay and Sarah Boyack to lead Scottish Labour. Reforming education to "make sure the poorest kids in Scotland don't get left behind" will be the central aim of Scottish Labour leadership candidate Jim Murphy if he is elected to the job. 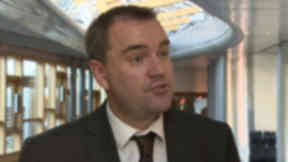 The East Renfrewshire MP is competing with MSPs Neil Findlay and Sarah Boyack for the role vacated by Johann Lamont in the wake of the independence referendum. All three have been outlining their case at hustings and meetings with party members across the country, with the new leader to be announced next Saturday. Mr Murphy has set out his main aim of a government led by him, with a focus on education by creating a national centre of excellence to share best teaching practice and reintroducing chartered teacher status. He said: "I am ambitious for Scotland and I want the best for our kids. That means no matter where you were born or how much money your parents earn, you have an equal shot at getting on in life. "But it's not enough for politicians to write some warm words about how awful things are, and then sit on the sidelines when it comes to doing something about it. So here's what I will guarantee if I am our nation's First Minister. I will act to make sure the poorest kids in Scotland don't get left behind by the government in Edinburgh any more. "The first thing I would do is identify the 20 secondary schools in the country where, despite the efforts of the staff, the poorest kids are being failed the most. This will be a combination of the schools with the lowest results, but also those with good academic records where too many of the poor kids are slipping through the net unnoticed. "I won't 'name and shame' these schools. They don't need that stigma — they need our support. "I will introduce Chartered Status for teachers, to attract the best talent to those worst performing schools. I will keep national pay agreements but will pay these teachers more as they bolster the life chances of those being left behind. "One of the big problems for some of these kids from the poorest backgrounds is the literacy levels of some parents, particularly mums. Lots of dads read to their children but it's often the mum who reads to the kids at night and helps with the homework. But in so many homes the mums are also playing catch up with their reading skills. That's why I will transform the under-performing schools into places of community learning and opportunity, where the parents can learn as well as their children." The former Scottish Secretary said he would also hold an annual review on progress in tackling educational inequality in schools and double the number of teaching assistants in some primary schools. The SNP said Mr Murphy "lacks credibility on these issues" and that chartered teacher status was a "discredited policy" under Tony Blair's UK Government. MSP George Adam said: "He talks about access and attainment but people remember when Labour voted to introduce tuition fees and he has, of course, also refused to commit his party to continued free university education in Scotland. "In contrast, just this week, the SNP Government announced further investment to help reduce barriers to learning experienced by pupils from disadvantaged backgrounds through the Access to Education fund. "While attainment in Scottish schools is good, and improving, we must continue to do all we can within the powers and resources to narrow that attainment gap and drive up standards at all levels — but people in Scotland are clear that the type of Blairite policies favoured by Jim Murphy simply aren't the answer." The other two candidates in the leadership race outlined their priorities on Saturday. Ms Boyack published a list of aims with a focus on social justice, while Mr Findlay said he will be ready to "hit the ground running" with a "progressive agenda" if elected leader. 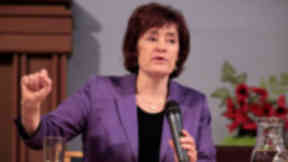 Lothian MSP Ms Boyack said: "Social justice is something that we all talk about in politics. It's what I came into politics to try to achieve. "It's almost 20 years since the late John Smith, leader of the UK Labour Party, led the Labour Party's Commission on Social Justice back in 1994. "John Smith's anger at the state of the UK at the time led him to establish the commission to inform the Labour Party's policy-making and provide the basis for a national debate about the future of work and welfare. "I will therefore set up a new project to mirror the work done by the Smith Commission in 1994. "This would look at social justice in the context of 21st century, and the enormous changes that have taken place." Mr Findlay said he will make the NHS and tackling inequality his focus if he becomes leader. 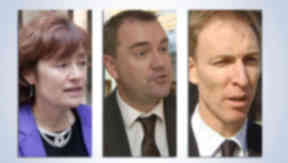 "If elected on Saturday December 13 I'll be holding Nicola Sturgeon to account in the chamber at Holyrood the next week, about their failure on the NHS," Mr Findlay wrote in an article on the Labour Hame website. "This is the sort of leadership we need to be showing — in the parliament and the country, and we need to be showing it now. "We must show that we have a vision of redistributing wealth and power determination to build social housing to meet need and create employment, to tackle health and wealth inequality, to deal with the social care crisis, to make work more secure and to end youth unemployment. "In making these issues the political priorities I will help Labour make Scotland a better place for all of us."